The finished product, after a blast with the immersion blender. The following recipe is heavily tweaked from what I found online. My alterations were to make the dish a little cheaper, as well as much healthier. The original called for three cups of coconut milk in place of the vegetable stock I will use. I never cooked with coconut milk before, so when I got to the store, grabbed a can, and noticed that there are nine grams of fat (all saturated) for just a quarter cup, I nearly fainted. No, I told myself. That would be over 100 grams of fat for a pot of soup that serves four people, and that doesn’t even include the oil and other ingredients. So, I took a chance and swapped in the stock. To still be somewhat faithful to the recipe, I sautéed the vegetables in a little bit more coconut oil than recommended (or you could have used canola oil). While this still adds a decent amount of fat, I’ll take 20 grams for an entire pot over 100 any day. Upon completion, I tasted it, and I thought the soup was amazing. Would it be better if done the original way? I don’t know, and I really don’t care to find out either. 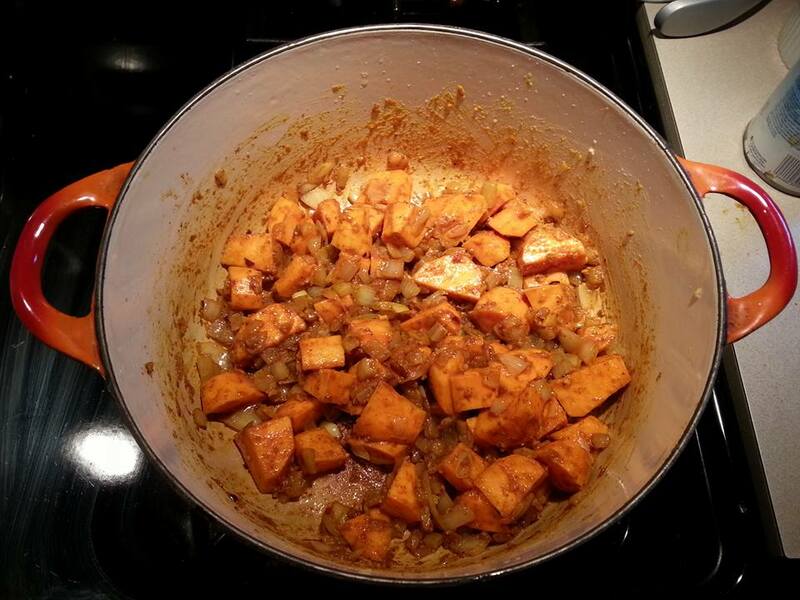 If you have some sweet potatoes laying around after Thanksgiving, you could put them to good use here. 1. You first saute the chopped onion in the coconut oil for about three minutes, just to sweat it a little. 2. Add the minced garlic, stir, and let it cook for another two minutes. 3. 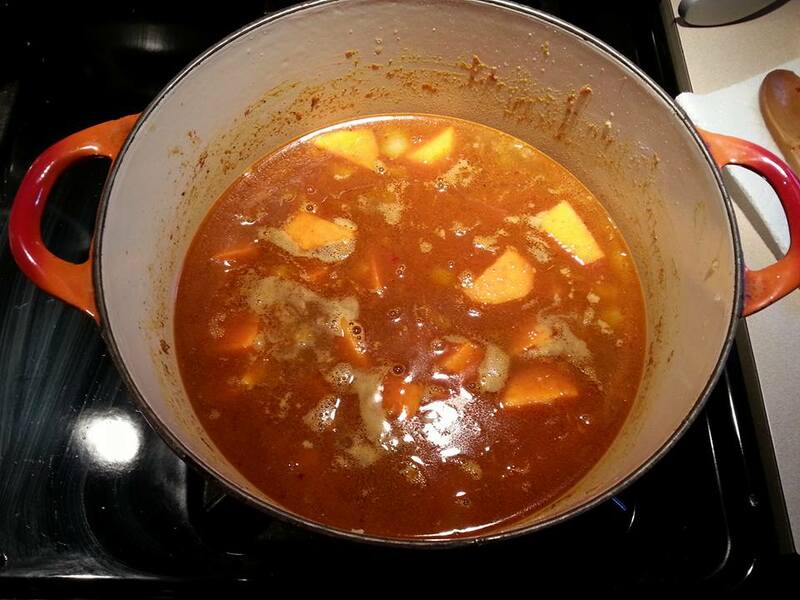 Add the sweet potatoes, curry powder, cayenne pepper, and a pinch each of salt and pepper. If wanting additional spiciness like I do, add about a half tablespoon of chili flakes and then just a slight drizzle of chili oil (or more, if you prefer). Cook for five minutes while stirring frequently. 4. Finally, add the vegetable stock, stir, and bring to a simmer. Once simmering, cover the pot and let cook for 25 minutes. You can also add more salt and pepper if you desire. 5. When time is up, remove from heat, and give it a blast with an immersion blender until the texture is smooth and creamy. The steps are pictured below in their three main stages. Steps 1-3. The onion, sweet potato, garlic, curry, cayenne, and chili flakes/oil have been sautéed in coconut oil. At step 4. The vegetable stock has been added and the pot is being brought to a simmer. You will find that this dish is incredibly flavorful and pretty spicy. Don’t let the heat discourage you, though—simply lower the amounts of those ingredients if you do not like spicy food. The taste has a great depth and complexity, and a nice balance between sweet and savory. The coconut from the oil breaks through ever so slightly. The immersion blender becomes such an important tool here, because it pulverizes everything until it is perfectly creamy. What we end up with is quite a rich dish for about a quarter of the calories due to the alterations I made. It is very good as a soup on its own, but I can see this becoming excellent as a condiment or dip for naan bread, or even heaped over a dish of basmati rice.